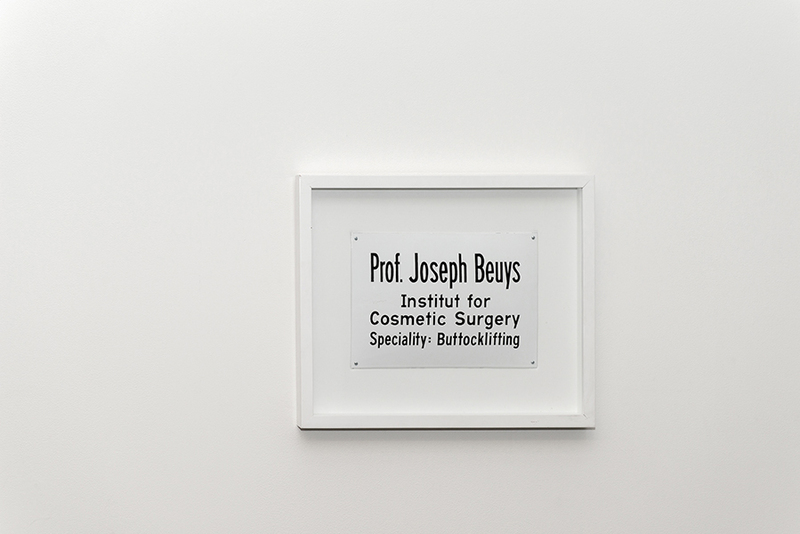 Joseph Beuys Works is an exhibition and round table discussion that enables students, the RMIT community and the public to reconsider the impact of the work of Joseph Beuys on contemporary socially engaged art practice. 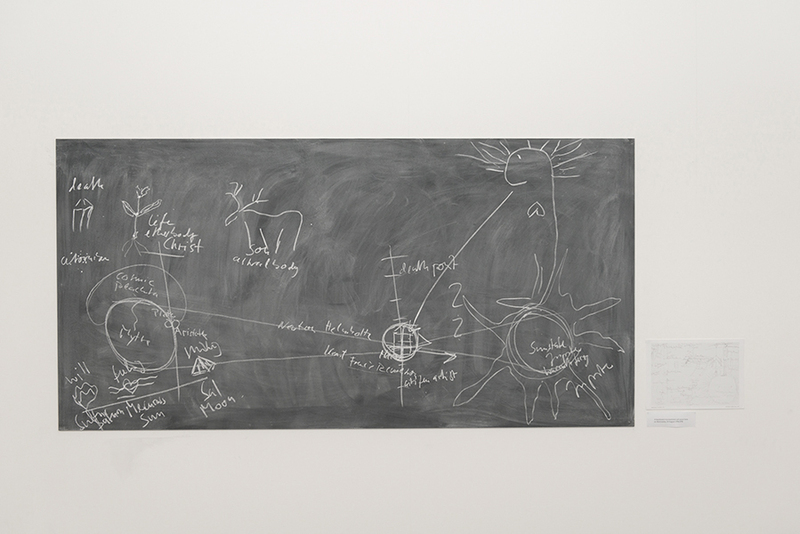 Joseph Beuys, Directive forces for a new society. 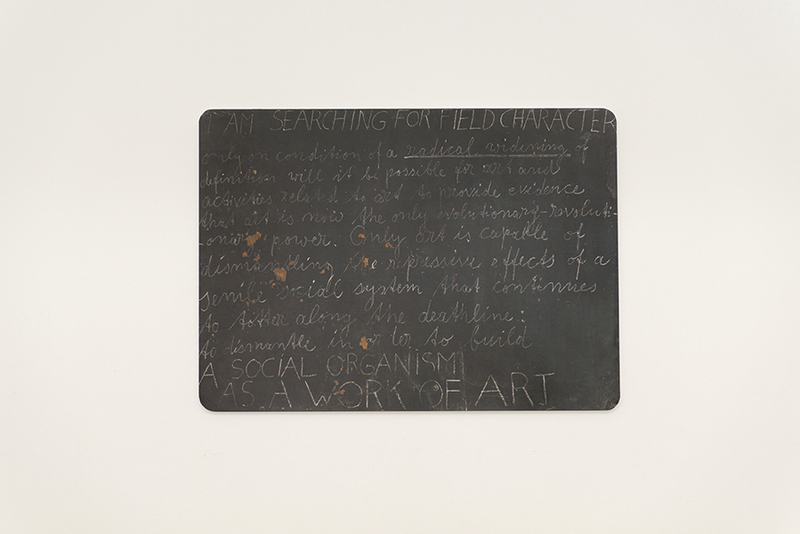 Blackboard 20, 1974-1977, Chalk on Board. 90 x 121 cm. Photo: Roman März (04.07.16). Reproduced with the permission of Staatliche Museen Zu Berlin, Nationalgalerie. Dr Wolfgang Zumdick is an author, philosopher, curator and Joseph Beuys-Social Sculpture specialist, working internationally. He has curated several Joseph Beuys and social sculpture exhibitions and is author of numerous publications on the history of philosophy and on 20th century art and philosophy. He has been guest lecturer at numerous universities including: University of Basel; RMIT, Melbourne; and Alanus University of Arts and Social Sciences, Bonn. Professor David Thomas is Professor of Fine Art in the School of Art, RMIT University, Melbourne. He has lectured extensively overseas in Europe, USA and Asia. David’s practice includes painting, photopainting and installation. It is informed by both Eastern and Western ideas of monochrome and geometric abstraction. He curates and writes on these issues locally and internationally. 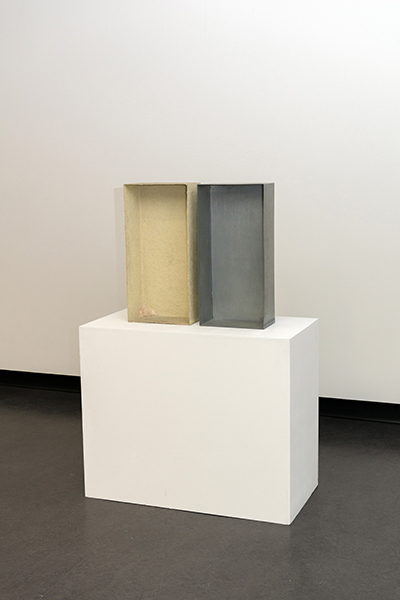 Solo and group exhibitions include: Tristian Koenig Gallery, Melbourne (2014); Conny Dietzschold Gallery, Sydney, Cologne, Hong Kong; Melbourne Now, NGV (2013), Dialogue, raum 2810, Bonn; Shifting Continuities Interventions and Microstructures, (with Christoph Dahlhausen), Heide Museum of Modern Art. Public collections include NGV, Chartwell Collection NZ, Lim Lip Museum, Korea and Kunstmuseum, Bonn. David Cross is an artist, curator and writer who works across performance, installation and public art. His practice brings together performance art and object-based environments, focusing on relationships between pleasure, the grotesque, phobia and the possibility of intimacy. Cross has exhibited widely across New Zealand, Australia, France, Eastern Europe, Canada and the United Kingdom. As a curator he has developed a number of temporary public art projects including One Day Sculpture with Claire Dohertyacross New Zealand, 2008–09, Iteration:Again in Tasmania, 2011 and more recently Treatment: 6 Public Artworks at Western Treatment Plant. He is Professor of Visual Arts at Deakin University. Julian Goddard. As well as being Head of School : Art at RMIT University, Melbourne, Julian Goddard is the founder and Chair of the Australian Centre for Concrete Art. 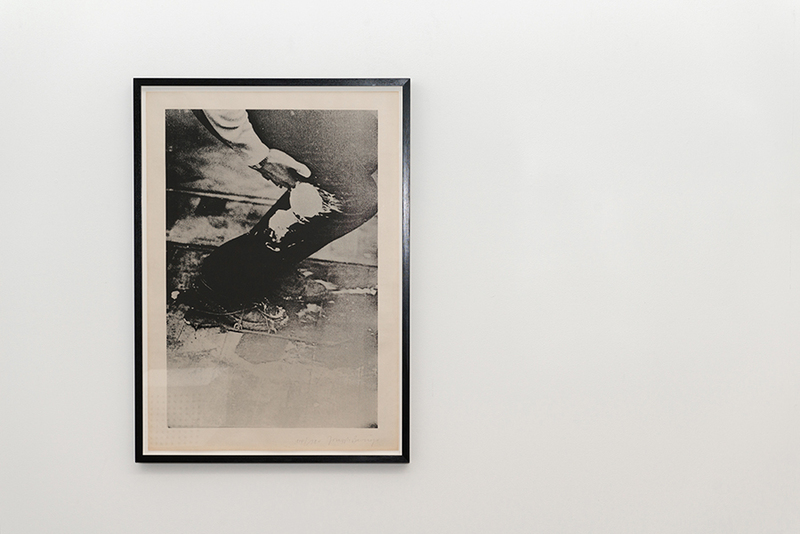 Goddard’s work as a professor, writer and curator specialises in the aesthetics of the everyday. He has curated over 200 exhibitions and published widely on Australian, Aboriginal and Concrete Art, in books, book chapters, articles, papers and many catalogue essays. In 1992, with Glenda de Fiddes, he established Goddard de Fiddes Gallery, which has represented leading Australian and international artists for over 20 years. He is also Chair of The Bureau of Ideas, an international forum that promotes the public discussion of art, design, architecture and philosophy through forums outside conventional academic institutions. Dr Grace McQuilten is an art historian, artist and curator interested in contemporary art and design and community development. She completed her PhD in art history at the University of Melbourne in 2008, researching the interconnections between art, design and consumer culture. In July 2011 she published Art in Consumer Culture with Ashgate Publishing in the USA / UK. In 2009 Grace founded The Social Studio, a creative social enterprise working with fashion and design to create employment and educational opportunities for young people from refugee backgrounds. Grace is an Honourary Fellow in the School of Culture and Communications, the University of Melbourne. Dr. James Oliver is a Senior Lecturer at the Centre for Cultural Partnerships (CCP), Faculty of the VCA and MCM, The University of Melbourne. His roles include Graduate Research Coordinator at CCP, and at faculty level he co-leads the Art, Social and Spatial Practice research cluster. As a research artist, James is a frequent collaborator with artists and researchers across community-oriented, participatory and live, art making and creative practice. His background is ostensibly social anthropology, and his first forays into research developed from investigating his native culture in the Scottish Hebrides - the language, social and creative practices, and place-based belongings. This research perspective further developed an explicit art and community intersection, also informed by Performance Studies and Spatial Theory. His research interests range through: methodologies of practice-as-research; improvisation and identity; ethnography; performance and pedagogy; and social-spatial analysis. James lectures across a range of postgraduate subjects at CCP - 'Rethinking the Creative City' (Master of CCD course), 'Research Methodologies' (MFA). He also contributes to undergraduate breadth subjects including CCP's elective, 'The Creative City', and the University Breadth Subject (UBS) 'Going Places'. 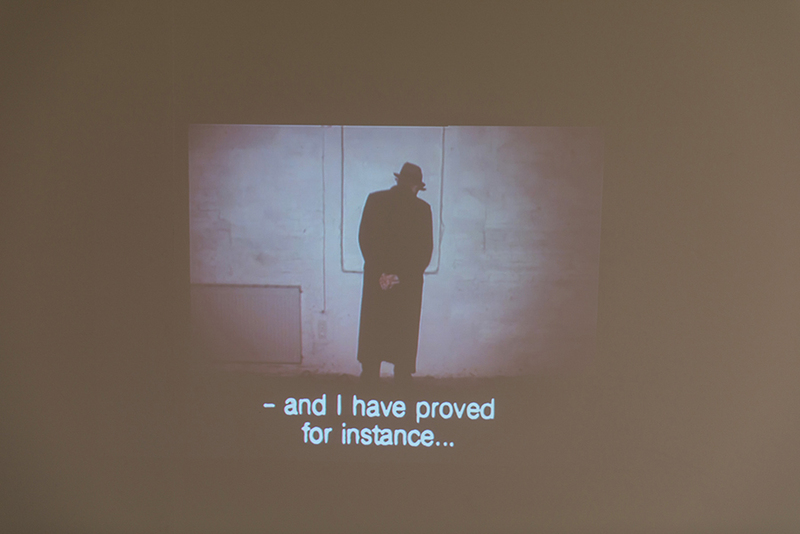 James supervises PhD students on practice-as-research projects, including with filmmakers, live and performance art, theatre, visual and contemporary artists and writers, in particular across intersections with the social and spatial.